A surge in the squirrel population means more critters in the crops for some farmers in New England. They’re running rampant in neighborhoods and farm fields. Some are ending up as roadkill. 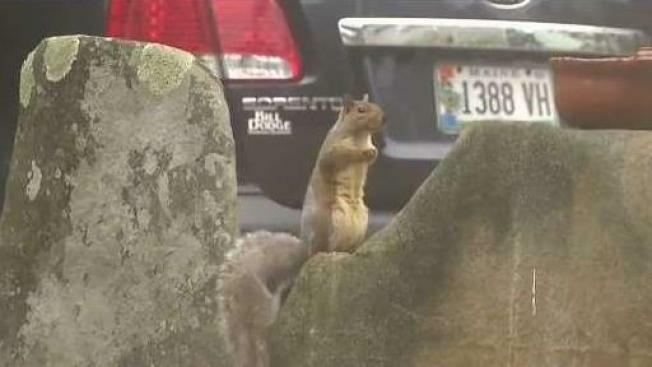 The number of squirrels in New England this year is nuts. “They’re all over the place,” said Gradeigh Cameron, Farm Manager at Randall Orchards in Stadish, Maine. A surge in the squirrel population has meant more critters in his crops. Cameron estimates squirrels have destroyed a few thousand bushels of apples and 75 pumpkins so far this season. “It is annoying, and it slows us down,” he said. Scientists suspect an abundance of acorns last year helped the squirrel population thrive, and survive the winter. That meant there were more squirrels around this spring and summer to breed. Some of the guys who work here with us have worked here over 30 years, and they’ve never seen this happen,” said Cameron. The increase in roadkill has inspired some satirical social media. The Twitter account “Dead Squirrels of Maine” makes light of the plight, and asks the Maine Department of Transportation to clean up the carcasses. But for some, it’s no laughing matter. Cameron said farmers don’t have many ways to mitigate the problem. “The only thing we can do right now is hunt them,” he said. The farm has allowed a hunter to use a BB gun and gather meat for squirrel stew. “It’s odd yeah, but it’s no different than eating rabbit, right,” Cameron asked. While some are stewing — others are saving the squirrels. The Center for Wildlife in Cape Neddick has taken in around 400 injured and orphaned squirrels this year, a number higher than usual. They currently have 63 in their care, and they say resources are being spread thin.